The whitetail rut had not yet begun, and most of the bucks were still roaming the countryside in bachelor groups or wandering on their own sparring with bushes and trees to toughen up neck and shoulder muscles. This period of deer season is not considered prime time for rattling antlers or grunt calls, but I learned a long time ago that there are few absolutes when it comes to hunting. I’d arrived at our Iowa hunting camp a couple of days early and had decided to head across the river to the Omaha Indian Reservation, where I also had an archery license. While there, I could hunt and also check the deer activity at several stand and blind locations. During spring turkey season, I’d dug a pit blind overlooking a spring hole that looked like it ought to be a deer magnet during the hot weather of early fall. I parked a couple of hundred yards above the spring and slipped quietly down to it toting several lightweight electric fence rods and a roll of camouflage netting, to better hide the pit blind for hunting at a later date. I also slung a new compound bow over my shoulder, for just in case. I spent half an hour rigging the netting around the pit, adding brush and dry grass to better blend it in with the background. By then it was mid afternoon and hotter than Hades, and I’d just settled back in the blind to take a sip from my water flask when I caught the white flash of antlers on a steep ridge a hundred yards or so above the spring. I didn’t have binoculars to get a better look at the buck, but I did have a grunt tube in my jacket pocket. I blew a couple of loud social grunts, just to see what kind of reaction I might get. Apparently, this buck hadn’t read the books and magazine articles that say a buck in hot weather prior to the rut will ignore a grunt call, because the next thing I knew, he came lunging and plunging down the slope in a shower of dirt and leaves. Things happened so fast I barely had time to pick up my bow and didn’t even have an arrow on the string when the hefty 9-point slid to a stop at the upper edge of the spring. Then he stood statue still, looking for the source of the sound. I love it when bucks pull mind-bending stunts like that. I managed to get an arrow on the string as the big deer casually moved to the seeping water below the spring and lowered its head to drink, all the time staying well within bow range. It was definitely a shooter. However, I knew there were larger bucks on the reservation, and I had almost three months of bow season left. I just couldn’t bring myself to end it so quickly. I know many whitetail hunters who limit their rattling and grunt calling to the pre-rut and rut, a period of two or three weeks. Not me. I rattle and use the grunt call from the first day of the early season to the last day of the late season. Early in the season, I do tone down the rattling and the calling, reducing the intensity and the volume. I am trying to pique a deer’s curiosity and bring it closer, not incite the aggressive response that will come later as the rut nears. Using this low-key technique, I’ve pulled bucks and does in from a half-mile away, and it usually is obvious they are simply looking for company or are curious about another deer in their territory. As the rut approaches, I increase the volume, intensity and severity of my rattling and grunt calling, trying to stir up a dominant buck’s territorial urges and pull him within gun or bow range. By then, cautious rattling with lightweight antlers will bring in far more small bucks. The big boys aren’t going to get overly excited when they hear what sounds like a couple of immature bucks sparring. A hunting client once told me that the first time he heard the initial contact between two monster bucks behind his stand he about jumped out of the tree. He assured me that there was no way a person with any kind of rattling equipment could possibly match the racket those two bucks made as they fought for half an hour within sight of his perch. He ended up voice grunting the vanquished buck back within range. He said the buck was a pipsqueak compared to the one that walked away, and it still scored a whopping 179 Boone & Crockett points. You just can’t make too much antler racket when hunting big bucks during the peak of the rut, and the same goes for grunt calling. There have been times when I have wished I had brought my elk grunt tube along, just to increase the volume and range. I have heard buck challenge grunts and snort wheezes that sounded like Hereford bulls bellowing. Pretty much all of my more experienced hunting clients say they take their biggest bucks when they throw caution to the wind and rattle, grunt call, break branches and stomp the ground with as much enthusiasm as they can muster. It’s the best way to convince a dominant buck that his territory is being invaded by a serious competitor. 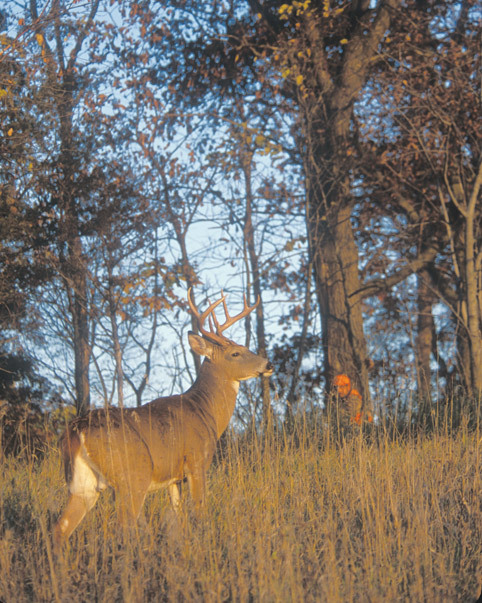 Combining a buck decoy with such rambunctious calling only makes the setup more convincing. A number of Midwestern states’ firearms seasons take place after the peak of the rut, and when the rut is over, most hunters hang up their rattling antlers and even their grunt calls and resort to driving and silent stand hunting. Big mistake. Those trophy bucks are still susceptible to grunt calls and rattling. This past fall, Tim Herald came to hunt with us, in hopes of shooting some video footage for his TV program. I planned to put Tim in a ladder stand above a dry dam in the bottom of a deep draw with timbered ridges and slopes in front and behind. The deer typically crossed the top of the dam moving from food plots to bedding areas above and behind the stand. Deer pushed off the surrounding properties also cross the valley on well-used trails, and it isn’t uncommon for a hunter to see more than 100 deer from that stand during the first couple of days of firearms season. When Tim arrived at camp, I recommended he try rattling, as I felt there was a good chance he could pull a buck into camera and gun range. The Iowa firearms season doesn’t open until early December, and he admitted that he’d never given much thought to rattling that late in the year, but the next morning he left camp with my favorite set of antlers around his neck. A number of does and smaller bucks passed his stand early in the morning but nothing in the trophy class. Midmorning, he glassed a heavily antlered 9 point, definitely a “shooter,” accompanied by several does. The buck was out of range on the facing timbered slope, several hundred yards down the valley, so Tim figured he had nothing to lose. He picked up the antlers and started rattling loudly. The buck immediately broke away from the does and trotted straight through the timber until it was directly across from Tim’s stand. When the big buck stopped at 80 yards to pinpoint the source of the ruckus, Tim tripped the trigger on his .50 muzzleloader and dropped the buck in its tracks—all on camera. As rutting activity winds down or ceases entirely later in the season, I temper my rattling and grunt calling back down to the curiosity level. The deer might not be driven by the same urges, but they still use their voices and their ears to locate and keep tabs on one another. In fact, deer that have been hunted for several months are about as cautious as they ever get, and when they hear the soft, subtle sounds of another deer or even the gentle tinkling of antlers, it can alleviate their innate caution, and that may be just what I need to sucker one into bow range. Mossy-horned bucks that have felt the pressure of several hunting seasons can be especially prone to late calling that assures them there are other deer about and it’s safe to venture that last few yards into the open to feed. Coaxing a wary old buck from heavy cover into the open where he may present a shot even a few minutes ahead of his normally nocturnal schedule can make the difference between scoring and going home empty-handed. Extreme cold actually helps to increase the effectiveness of soft and subdued rattling and grunt calling. Crisp, still air carries sound extremely well, and deer can pick up low-intensity calling sounds at incredible distances. A couple of seasons ago, I was hunting the January muzzleloader season in Iowa, one of my favorites. It was late afternoon, and I was hunkered down against the base of a cedar, overlooking a food plot where we’d observed a monstrous 11-point buck several times during the earlier seasons but hadn’t been able to get a client within bow or gun range. The temperature was well below zero without a breath of a breeze. Within an hour of my getting settled in, several does and a pair of 2-year-old bucks had fed past within easy muzzleloader range. Then a nice 10-point eased out of the brush at the far end of a food plot 200 yards away. It stood without moving, no doubt surveying the field. I had forgotten my rattling antlers (do as I say and not as I do) but did have an A-Way Bowgrunter Plus pinned to the outside of my insulated body suit, with the tube fastened where I could reach it without much movement. There was less than 30 minutes of frigid hunting light left. I slipped the tube into my mouth and sucked out several soft but insistent doe grunts to see if the buck would react. The deer’s head snapped up, and without hesitation, it started fast stepping straight toward me. A couple of minutes later, that buck was standing less than 10 yards in front of me, totally unaware that the snow-colored lump against the tree was dangerous. My .45 was resting solidly on the shooting sticks, and the cross hairs of the scope were settled on the deer’s shoulder. All I had to do was apply a bit of trigger pressure ... but I just couldn’t do it. The season wouldn’t end for another three days, and I knew if I squeezed that trigger, I wasn’t going to get a shot at the 11-point I really wanted. Once more, I passed on the shot. Three days later, when Iowa’s unpredictable winter weather delivered 55 degrees with 50 mph wind for my last evening’s hunt, I was thinking about that big buck centered in the scope. I ended up grunting in a big fat doe for the freezer, and that ain’t bad.